The event takes place on the 16th of February until the 24th of April starting at 18:00. 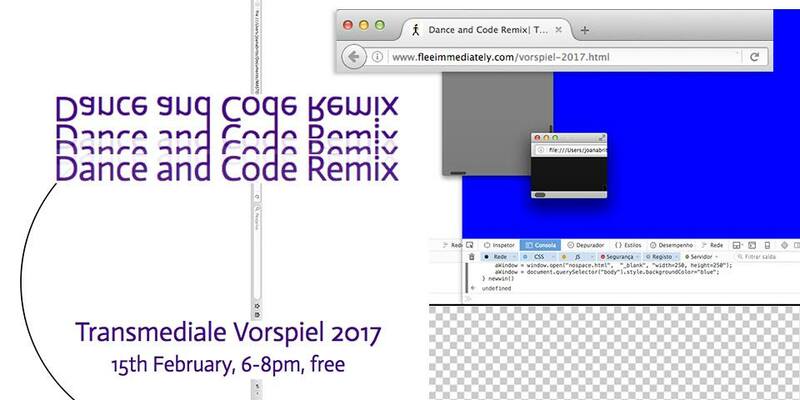 Flee Immediately!, with Joana Chicau, will present a series of workshops and performances experimenting with choreographic relations and code, from bodies of code to actual bodies, from digital deviations to physical ones. This includes a performance that reframes aesthetic experiences through the poetics of web programming languages and tango as choreography, a workshop enacting basic programming through dance, as well as experiments relating code, poetry, movement, and control, and more. The event series is part of a larger collaboration and research that began in Flee Immediately! issue 02. A playful performance-installation. Everybody can participate. The setup adresses the notion of progress and the unwillingness to move. It features commands that describe elements of dance. It tackles understanding, harmony, and spoken words as a carrier waves of interrelation. It’s a bit like Karaoke. The cryptodance is a performative event to familiarize ourselves with different modes of encryption. Whilst collectively embodying issues of security, privacy, safety and surveillance, we converge a technopolitical urgency for souvereignity and a desire for affinities with the body /machine~ living organisms/algorithms. Cryptodance is developed by an international small constellation of choreographers, hackers, dancers, …. (bolwerK, Goldjian, Karine Rathle, Ellen Foster, Marthe Van Dessel, Margaret Westby,..). They met, discussed and wrote a choreography combining dance annotations, crypto technics and careful somatic tactics.